After a little bit over two months, I’m pulling the plug on the fermentation phase of this sauerkraut and moving on to the consumption phase of this batch. 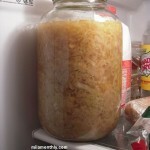 There was only a couple of things that I did to the sauerkraut before placing it into the fridge. 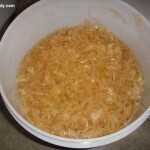 2) I squeezed all the brine out of the sauerkraut, leaving the brine in the fermentation bucket. 3) With the remaining brine in the fermentation bucket. 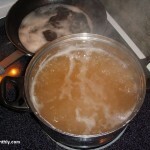 I racked the brine to a stock pot and brought it to a rolling boiling, and kept it boiling for 15 minutes before cooling it down to room temperature in an ice bath. 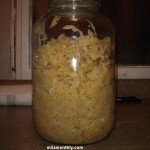 4) Once the brine was cooled, I poured it back over the sauerkraut in the jar, just until the sauerkraut was covered in brine. 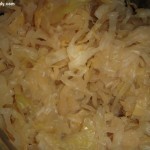 Now its time for me to start making some Reuben sandwiches at home, so I can consume all this sauerkraut. Good thing I didn’t buy more cabbage before St. Patrick’s day when it was $0.09 a lb, to start a second batch of sauerkraut. Since then I really would have had sauerkraut up the wazoo! 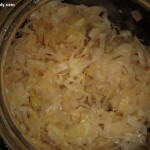 Its been a little over a week, and the cabbage is finally starting to slowly look and taste like sauerkraut, though it still has quite a bit of the cabbage crunch. 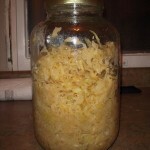 Another couple of weeks fermenting, and we should be in sauerkraut city. When my mom mentioned if I had collected a large stone to place on top of the cabbage in the fermentor, I really didn’t understand what she was getting at. Well a week later I now understand the point she was making. The glass salad plate that I had used to submerge the cabbage in the brine was woefully insufficient. After about three days, all the gas that the cabbage was generating caused quite a bit of volume expansion in the fermentor to the point that I would have to squeeze down on the cabbage daily to degas it. Next time around I’m going to wrap a 15lb or 20 lb weight lifting plate in plastic in order to keep the sauerkraut submerged. For some reason this year, I’ve grown all these jalapenos, but I’m not really in the mood it eat multiple pounds of jalapeno poppers. So instead of making jalapeno poppers I’m going to cut the jalapenos into rings and try to pickle and can them.